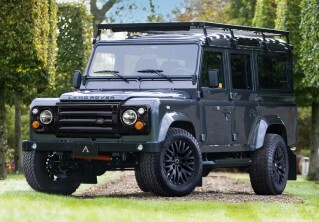 This Defender will shortly cross the sea to conquer the rocky mountain trails and canyon lands of western USA. Arkonik Defenders are undefeated in their dominion over other off-road restorations and DROGO will continue to lead the charge. This Coniston Green D110 is now ready for a nomadic life beneath sun and stars, equipped with Baja Designs® LED spotlights and Trucklite® twin-cat headlamps. The Front Runner® roof rack will carry everything required, whilst the Terrafirma® suspension with 2” lift-kit and Safari® wading kit are ready for whatever terrain lies ahead.